Both Article 24 and Article 29 of the United Nations Convention on the Rights of the Child highlight a child’s rights related to the environment. Article 24 presents a child’s right to the highest attainable standard of health, including the right to nutritious food and safe drinking water, as well as protection from environmental pollution. Article 29 focuses on a child’s right to information on environmental health issues and defines environmental education as one of the goals of education. Together these Articles, as well as many other Articles within the Convention on the Rights of the Child, help protect children’s rights, including their right to a safe and healthy environment. 1 United Nations Human Rights Office of the High Commissioner. (1989). 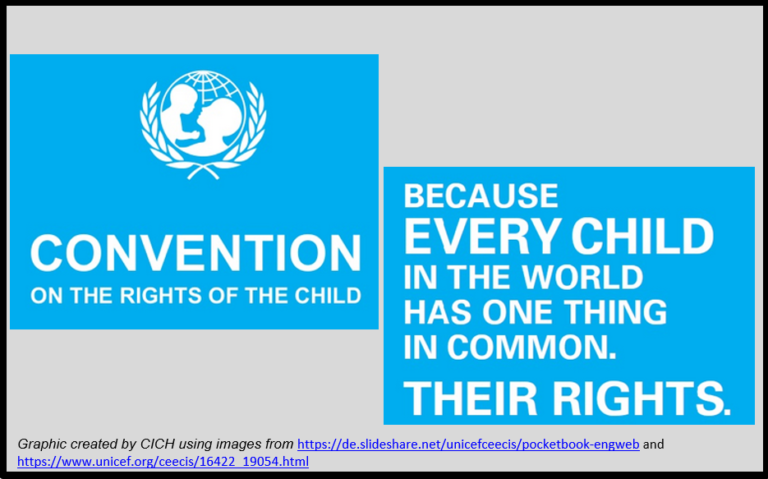 Convention on the Rights of the Child, accessed March 12th, 2017. (c) To combat disease and malnutrition, including within the framework of primary health care, through, inter alia, the application of readily available technology and through the provision of adequate nutritious foods and clean drinking-water, taking into consideration the dangers and risks of environmental pollution.